PRESIDENT Edgar Lungu says Zambia’s rising foreign debt stock running to over US$9 billion is necessary because the people are appreciating the many roads and schools that are being constructed countrywide using the borrowed money. And an emotionally-charged President Lungu says Zambia’s fight against corruption must be prosecuted with noble intentions as opposed to baseless screaming newspaper headlines and name-calling anchored on labelling some people as corrupt. 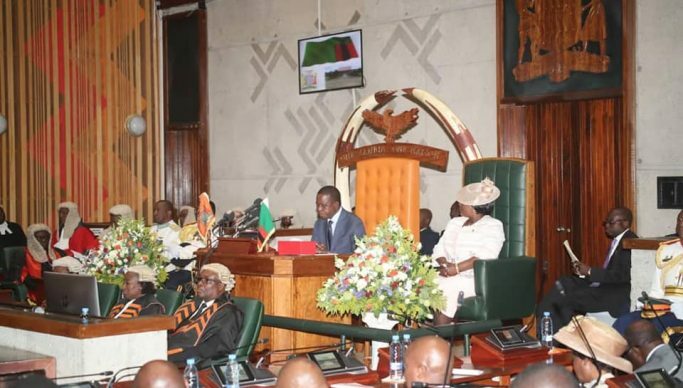 During an address to the Zambian parliament in Lusaka on Friday, President Lungu acknowledged that the issue of the country’s ‘rising’ debt stock was a topical one. During a radio programme on Lusaka’s 5FM radio station on Thursday, Bahati PF member of parliament and former foreign affairs minister Harry Kalaba, asked the PF leadership to give Zambians the complete story on the road projects being carried out all over the country. Kalaba challenged his former government peers to explain whether they were not conniving to siphon money using these projects. President Lungu however, assured that the government will bring down the debt stock to sustainable levels. He called for concerted efforts if the country was to attain the Vision 2030 of not only transforming the country into a middle-income prosperous society but also creating a SMART Zambia. President Lungu further acknowledged that Zambia has very disturbing statistics of social inequalities and that unfortunately it appears these development inequalities have a female face. President Lungu said the government’s E-Voucher farmers’ input distribution programme where over 5,000 agro-dealers were participating currently would continue because it was effective and had created jobs. And President Lungu said the fight against corruption in the country was devoid of honesty and characterised by narrow and divisive agendas reflected in baseless screaming newspaper headlines accusing individuals of being corrupt.